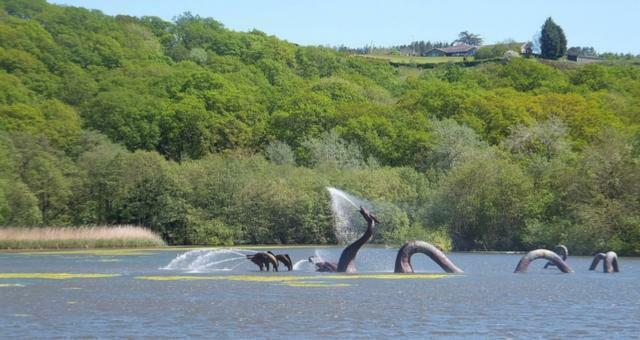 Llandrindod Wells Lake Park at Llandrindod Wells01597 822600work LakeThe 13-acre lake, an unexpected feature of the town with a magnificent dragon statue at its centre, is a perfect place for a stroll or cycle ride. Visitors enjoy the views of the lake and surrounding area and the nearby picnic area is popular in the summer and there is a Lakeside Café and Bistro that provides light refreshments and full meal services. Llandrindod Lake was originally built as a boating lake towards the end of the last century when Llandrindod Wells was a prime Victorian tourist destination with thousands of visitors arriving each year to take advantage of the famous spa waters. The original boathouse can still be seen to the left of the lake, now converted into a private residence. 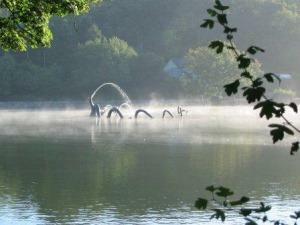 The 13-acre lake, an unexpected feature of the town with a magnificent dragon statue at its centre, is a perfect place for a stroll or cycle ride. Visitors enjoy the views of the lake and surrounding area and the nearby picnic area is popular in the summer and there is a Lakeside Café and Bistro that provides light refreshments and full meal services. The lake is also popular with fishermen and has recently been drained, cleaned out, and new fish stocks introduced. There is an abundance of wildlife including ducks, geese and swans. The island in the middle of the lake provides an undisturbed habitat for birds, insects and other wildlife.